UK: The UK Department of Health recently announced that it would loosen hygiene rules for Muslim and Sikh doctors and nurses. 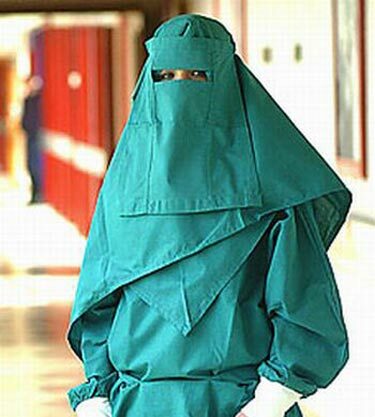 From now on, Muslim female staff will not need to wash their hands before procedures as it compromises their modesty. Instead, they will have the admittedly less sanitary option of wearing disposable plastic over-sleeves. Read More: Washing Hands Compromises Modesty? medical scrubs and instead can wear long sleeve scrubs for religious reason. Whew! This is kind of discrimination eh, specially that there are many diseases that can be link to proper dress code and washing of the hands of healthcare workers. IS PROOF that they're liars, and the whole BULL about 'balancing blah blah vomit without compromising patient safety' is a lie. Whenever you hear "to balance this between this" they mean REALLY "to choose what we want to and then say there's a balance, which is a lie"
as an lvn student it seems that the truth.about infection,built thru years of science and proof has now been thrown out the window.to satsfy a backward religion that kills heath care workers trying to immunize children against small pox,thats religouslogic for you!